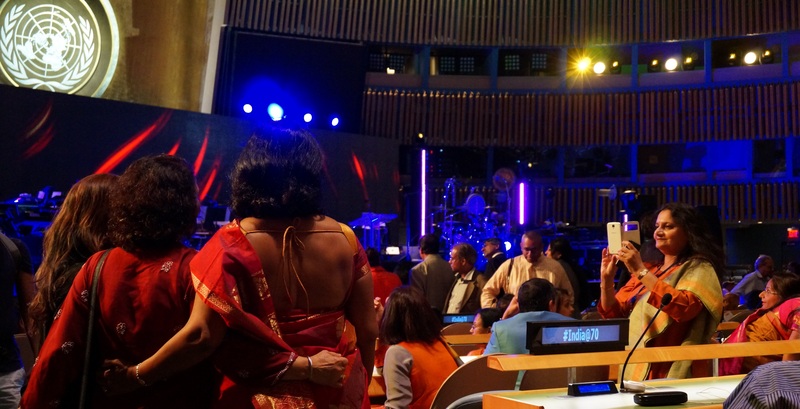 To see and hear – along with the 1,897 other souls who filled the UN General Assembly hall – AR Rahman, his band and his foundation’s Sunshine Orchestra perform on a stage normally reserved for the world’s political leaders was a rare, precious experience. The usual sea of somber suits was replaced by jewel-toned saris and elegant sherwanis. The curved, wood-paneled walls and the size of the venue made the performance feel personal and intimate. 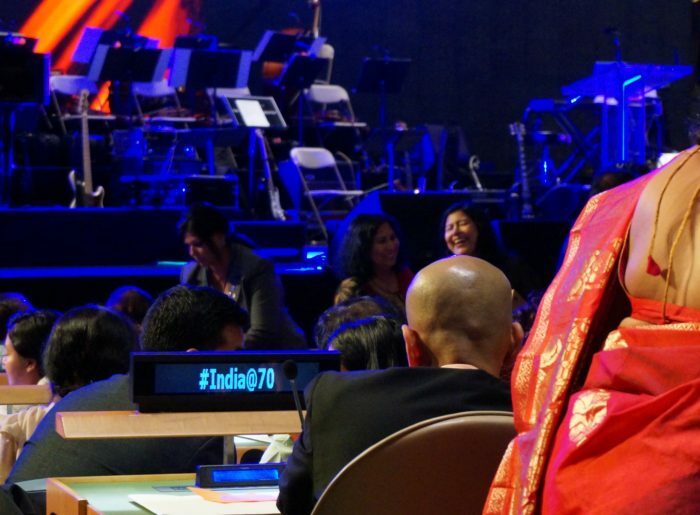 The last time an Indian musician performed there was MS Subbulakshmi in October 1966. AR Rahman’s concert on India’s Independence day was a tribute to “MS Amma” – for the centenary of her birth in 1916, and the 50th anniversary of her GA performance. 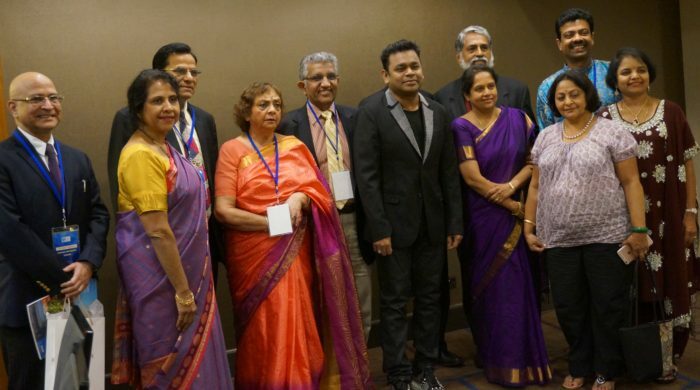 At an afternoon press conference, India’s Ambassador to the UN, Syed Akbaruddin, said preparations had begun six months earlier, with the support of a favorite charity of MS Subbulakshmi, the Chennai-based Sankara Nethralaya eye hospital, which treats 500,000 patients a year and performs 25,000 surgeries free of charge. I asked if he had any plans – aside from film soundtracks – to do an entire album of his own Tamil music (I confess, it’s a big wish of mine), all sung by him. 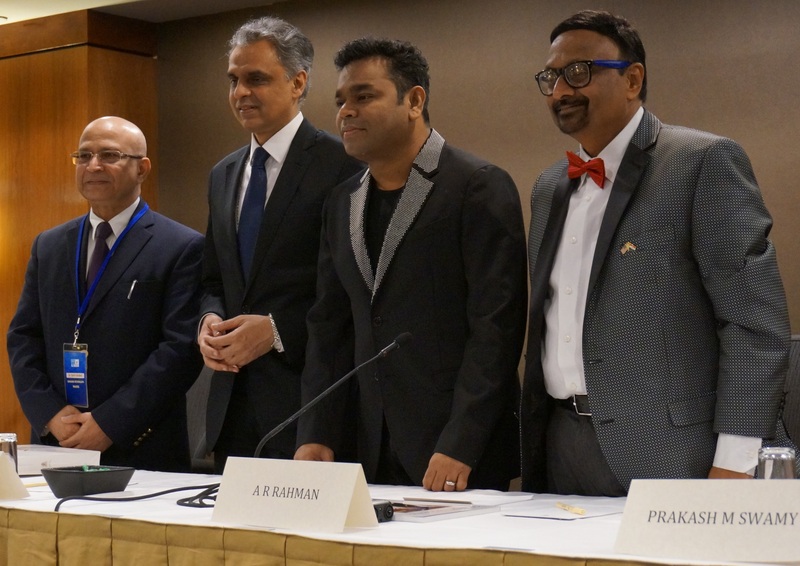 “I want to do that,” Rahman said, “but I want to be a better singer.” Luckily for the UN audience, such perfectionism doesn’t prevent him from singing in public now. Before AR Rahman took to the GA stage that evening, there was an invocation by Geeta Achari, singing MS Subbulakshmi’s trademark Maithreen Bhajatha and Hari Tum Karo with piercing clarity. 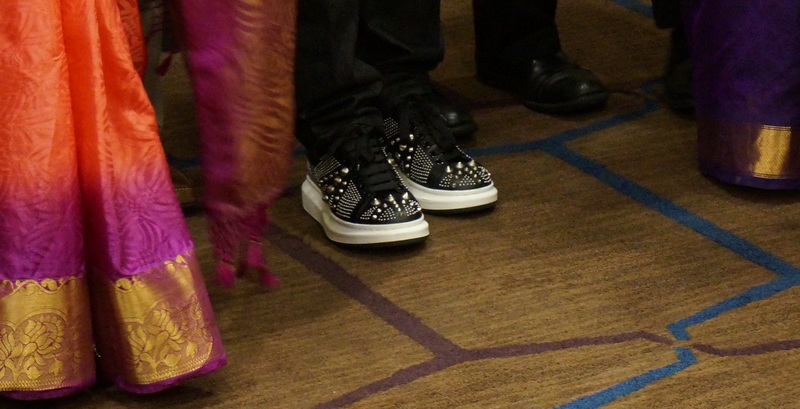 The audience was already making appreciative noises, including the sari-clad older woman behind me sang along softly, tapping her foot in time on the leg of my chair. 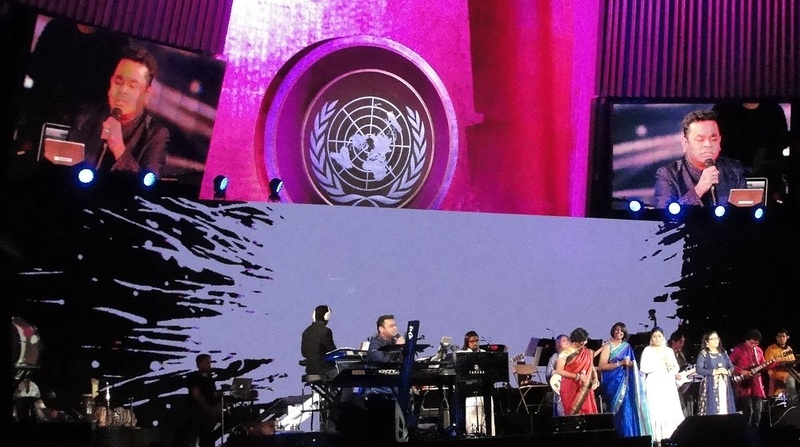 AR Rahman opened with Vellai pookal (from Mani Ratnam’s Kannathil Muthamittal), appropriate for this venue, given the song’s focus on children and peace. Then he went right into an instrumental version of Vande Mataram as a huge neon blue Ashoka chakra glowed on the screen behind him. 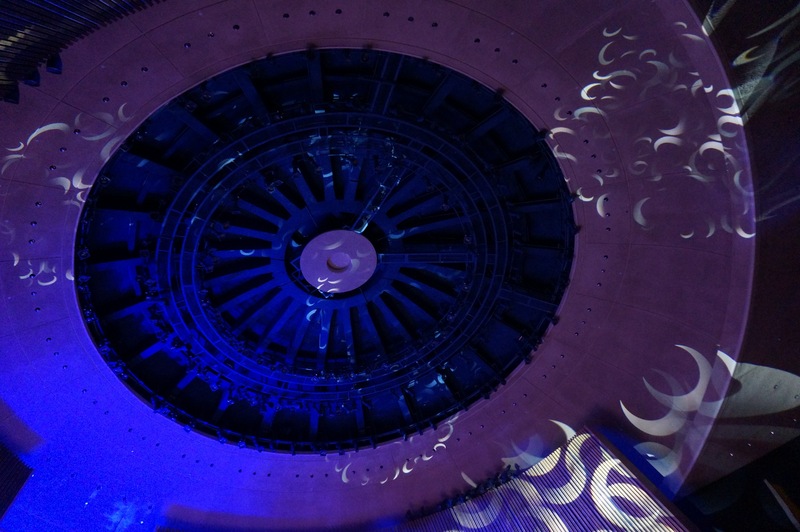 Throughout the night, moving images on the screen mirrored the mood of the song. As Harini Srinivasa Raghavan, Harshitha Krishnan, Roopa Mahadevan, AR Reihana and Ishrath Qadri joined voices for the haunting Malarodu Malaringu from the movie Bombay, flames showered down on a smoldering city in ruins appeared onscreen, like you’d imagine Mumbai after a nuclear bomb. 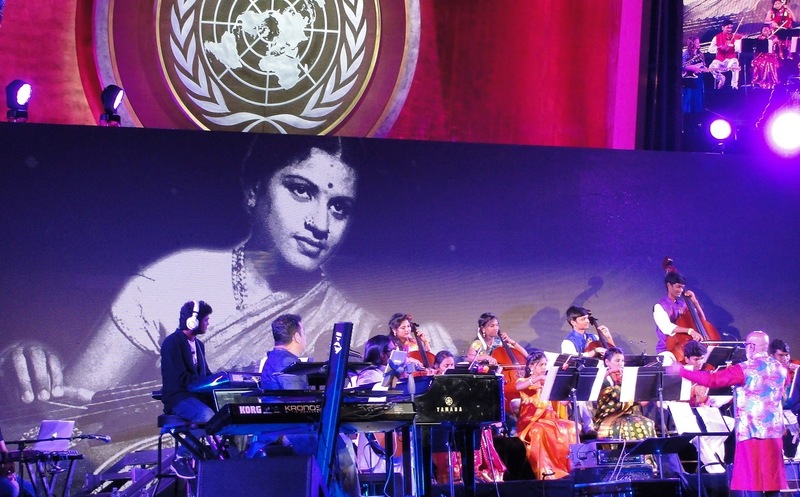 For more of the tribute to MS Subbulakshmi, Rahman gave the floor to the Sunshine Orchestra who played the Endharo Mahanubhavulu and Raghavamsa Sudha kritis and Kurai Ondrum Illai. 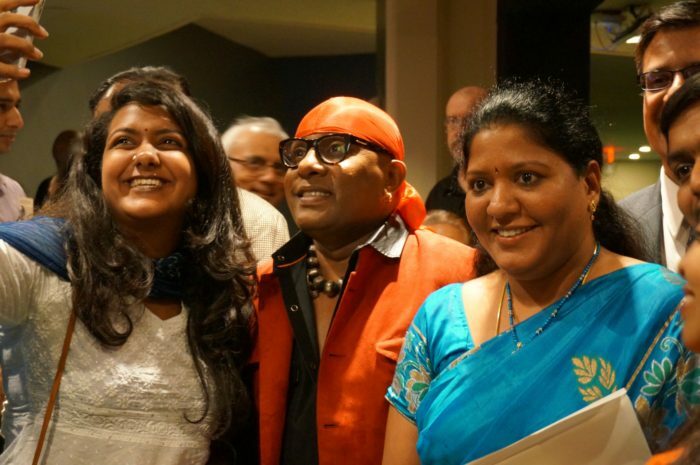 I couldn’t stop watching two cellists in the back row, Vaijayanthi R and Deepa S – one clad in a bright crimson sari, who would smile when realizing the camera was on her, and her neighbor, in a brilliant gold and turquoise sari whose nails on the fingerboard were painted a matching shade of blue. AR Rahman’s much talked about use of technology was evident here. 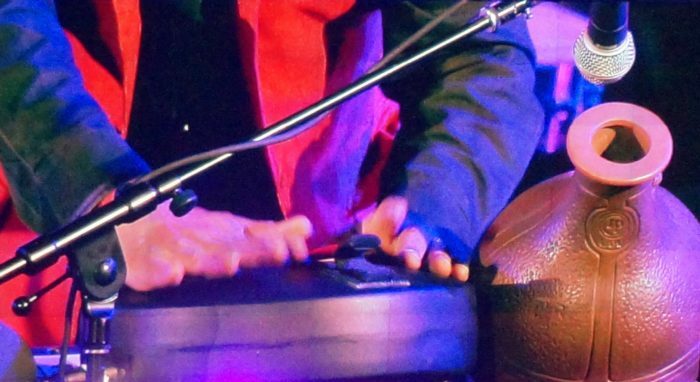 As well as two Macbooks on stage, I spotted two stands holding iPads, which ARR and other singers used to scroll through lyrics. Not too many people using sheet music, other than the orchestra members. What really fascinated me was the black electrified ghatam that Sivamani played. Clearly we are in the 21st century when a clay water jug has been transformed like this. The 19 pieces performed on August 15th were primarily Tamil, glancing back as far as 1994 to include film songs Uyirum Neeye and Ennavale. On Ennile Maha Oliyo AR Rahman was joined by his sisters, Rayhanah and Issrath Quadhri, as they had on Coke Studio. 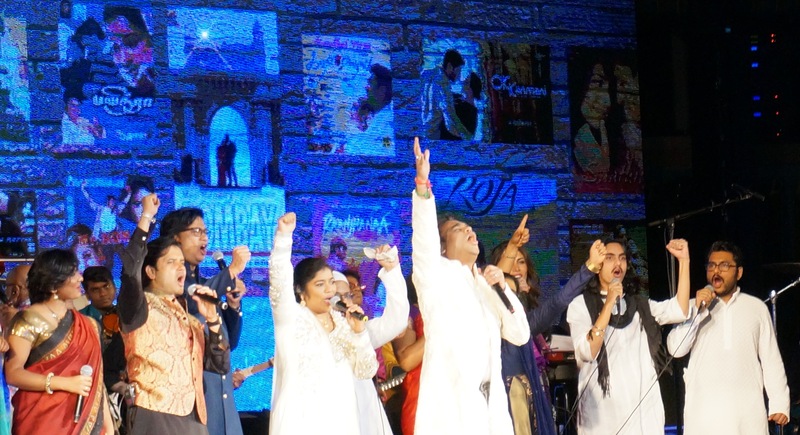 Some of the Hindi film songs gave the band opportunities to stand out. In Dil se re, Swedish bass guitarist Elin Sandberg had her moments to shine, then “Drums” Sivamani jumped into the fray, followed by an electric guitar solo. Ranjha ranjha wove its way through a male chorus, developing a reggae beat. 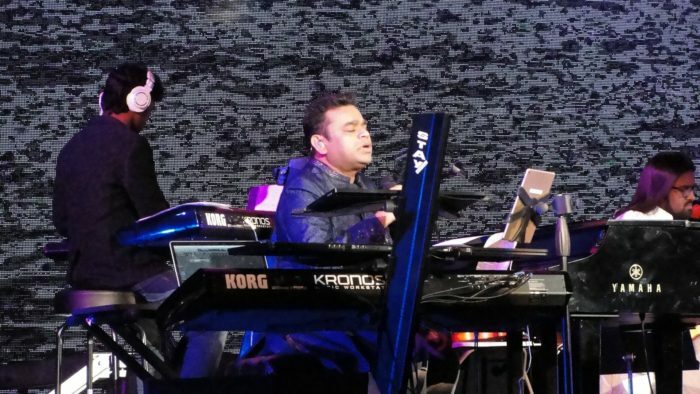 As everyone else took a short break, it was time for a showdown between guitarist Prasanna and percussionist Sivamani on Aley Payuthey. During the evening, Dutch and British diplomats tweeted their enjoyment of the show. Ad man, cinematographer and director Rajiv Menon was also present. 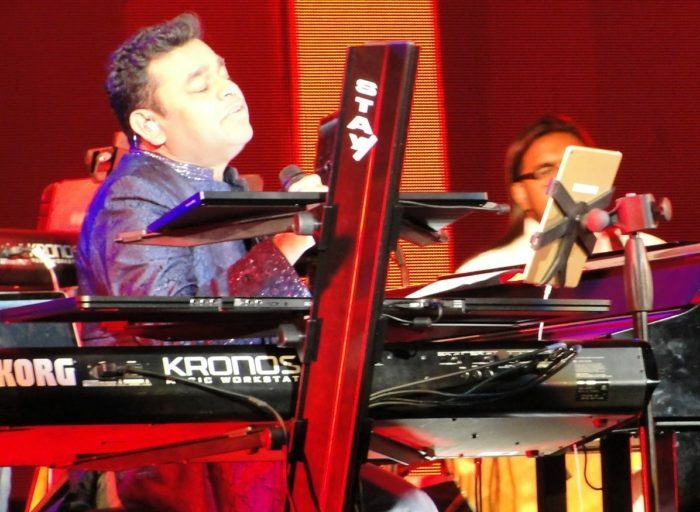 AR Rahman did the music for Kandukondain Kandukondain, Menon’s Tamil take on Sense and Sensibility and the pair are rumored to be collaborating again. I never expected the concert to last two hours. I assumed there would be – at most – an hour of actual music after the speeches finished. 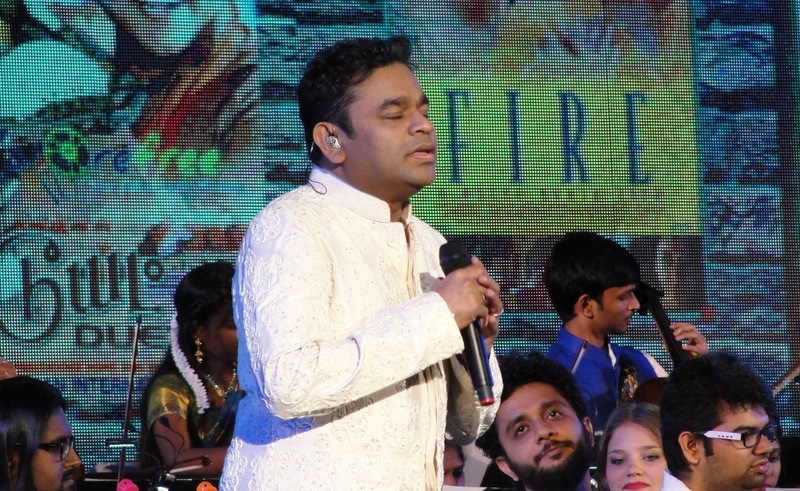 Quite a few people slipped out during the qawwali encore of the show (Khwaja Mere Khwaja, Faaya Kun, and Maula Maula) as Rahman reappeared, clad in white, seated at a harmonium with the male vocalists. Even the dome of the GA was bathed in blue light and crescent moons. The Oscar-winning song, Jai Ho, from Danny Boyle’s Slumdog Millionaire, closed the show as posters of AR Rahman’s many films – Hindi, Tamil, indie – scrolled past. The audience jumped to their feet, many rushing forward to take selfies.